During the Second World War, many works of art and cultural property from the private and public sectors were abandoned, stolen and/or looted. Belgium was no exception and a large art trade then developed, mainly in Central Europe and the West. After the Second World War, much of this cultural property was identified, located and returned to their rightful owners, to their heirs or to the state(s). However, the provenance of all the cultural property found was not always obvious. It was also difficult to determine whether they had been stolen and to whom they belonged before the War. Some of this cultural property was recovered after the years of occupation and the liberation, either by individuals or at government level. At the Washington Conference in 1998, Belgium was a signatory to the statement of principles concerning looted and missing cultural property from the time of the Nazi occupation. Museums and cultural institutions co-operated with the Jewish Property Studies Commission and the Restitution Commission to establish the provenance of this cultural property. 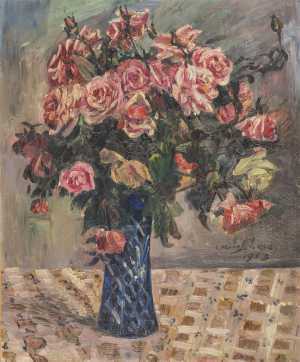 The items in question were works of art that were possibly looted or bought by the Nazis, including those returned to and by Belgium after the War. The survey took many years to complete. After these investigations and in order to ensure transparency, it was decided to create a database of works of art whose provenance could not be identified or remained incomplete in order to obtain more information regarding the history of the acquisition. This database focuses mainly on paintings and sculptures found in museum collections after the Second World War. The survey is the result of close co-operation between the Communities, the Federal authority and the institutions and museums concerned. The survey was concluded leaving one work of indeterminate provenance: the owner of the painting Flowers by Lovis Corinth (1914, oil on canvas, 81 x 66, inv. 6605), prior to 1944, could not be traced. Any information which could help to clarify the provenance of paintings, especially during the pre-war period and the Second World War is welcome. We thank you in advance.